Good evening, space fans! 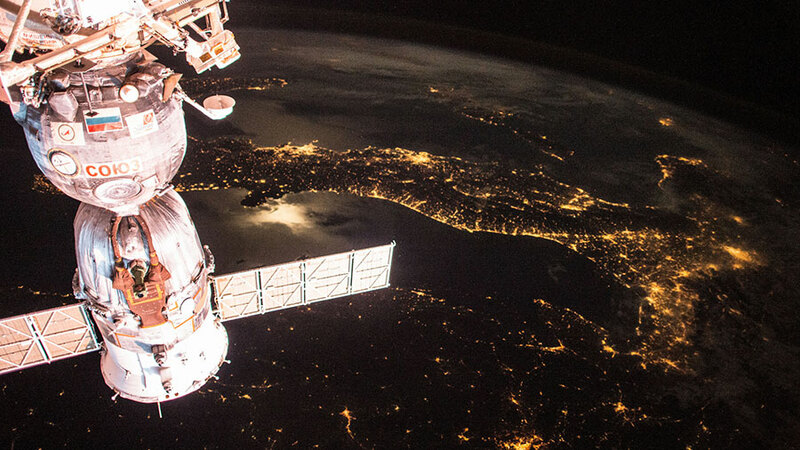 Its been another week of scientific spectacularity about the ISS. Here's what's up! Yesterday, a PDAM (pre-determined avoidance maneuver) was conducted to prevent the ISS from colliding with a piece of space debris from a spent Minotaur rocket. The debris had remained in orbit since 2013 and was tracked by mission control, which prevented the ISS astronauts from being put in serious harm's way. The Progress 58 thrusters aboard the station were fired for 5 minutes, 22 seconds to raise its orbit, allowing the chunk of Minotaur to pass by a safe three miles away from the station. The ISS currently now resides at 254 x 244.8 miles above the Earth. Earth, which at times "looks like a combination of sweet and savory,"
in the words of astronaut Scott Kelly on National Donut Day. On Sunday, ESA astronaut Samantha Cristoforetti set the world record for longest-duration spaceflight by a female - 196 days. She surpassed NASA's Suni Williams, who had stayed aloft for 195 days during Expeditions 14/15, which ran from December 2006 to June 2007.
around the ISS's Columbus laboratory. Cristoforetti, along with NASA astronaut Terry Virts and cosmonaut Anton Shkaplerov, will return to Earth on Thursday morning at 9:43 AM. In addition to their usual scientific duties this week, they have been conducting spacesuit maintenance to assure that their return will be comfortable. The Soyuz TMA-15M (pictured) will return the astronauts back down below. The 50th anniversary of the Gemini IV mission occurred on June 3rd. The mission, which was the first that was monitored by mission control in Houston, also featured the first American spacewalk by astronaut Ed White. The ISS has been the floating-off point for 187 spacewalks, all thanks to the early NASA adventurers. "This is the greatest experience, it's just tremendous." Our modern missions stand on the shoulders of giants, both human and technological. Scientifically speaking, astronaut Scott Kelly took blood and saliva samples for the Cardio Ox experiment, which will assess astronauts for stress and atherosclerosis at different points in their mission. Ultrasound scans of the carotid and brachial arteries are also obtained as part of the experiment, which requires taking samples and readings before launch, 15 and 60 days into the mission, 15 days before landing, and within days of returning to Earth. This will eventually create a comprehensive analysis of how stress affects astronauts at different points in their journey. Speaking of different points in the journey, a breakthrough technology that was added to the ISS now helps ships get tracked all over Earth's oceans. The Vessel ID system can pinpoint any ship on Earth and, in this astonishing video, shows how it can save lives even in the most dire of emergency seafaring situations. Yet another piece of technology that works in space to help humans on Earth! This is a really amazing rescue story...from space to the sea! That's all for this week, space fans! Tune in next week to see how our Earthbound adventurers fared on their trip home. Watch this space! 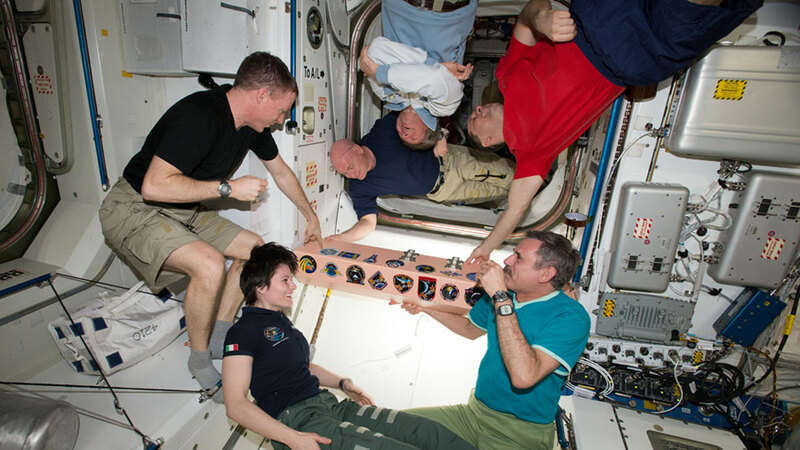 the ISS bulkhead with their mission patch.